Housed in a former printing press building, Bar Melusine makes up one third of Seattle restauranteurs, Chef Renee Erickson and Jeremy Price’s new eclectic trifecta. Divided into three separate venues, Melusine is neighboured by Bateau, a modern steakhouse, and their sweeter counterpart and donut shop; General Porpoise. The duo looked to mermaids and the French-Atlantic for inspiration for the new Capitol Hill oyster bar and playing with iterations of the word, they landed on Bar Melusine, the French term for these elegant water spirits. 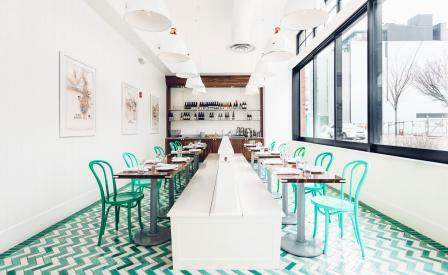 Under their interior design practice, Price Erickson, the duo has led the vision with hues of teal, crisp whites and satin brass that draws you into the bright, street-front windows and drops you into a herringbone sea of multi-tonal, handmade, imported Moroccan tiles. The sleek, white marble oyster bar sits below a series of vintage pendent lighting salvaged from a local gymnasium, while custom brass light fixtures play up the intimacy in each of the white, timber banquettes. James Beard-nominated Chef Erickson and Chef d’Cuisine Jay Guerrero’s menu focuses on the flavours and ingredients of Normandy and Brittany; fresh, seasonal oyster selections and inventive, artfully constructed dishes bring home this nod to a whimsical, French holiday.